"--glorious Soviet -- soon bring Hitler -- complete defeat. Heavy casualties -- Dnieper River--"
The voice from the radio faded into the deafening hiss of static. Nadezhda knelt to adjust the tuning dial again, but lost the transmission completely. Her temper flared and she smacked the box in frustration, then thought better of it and returned her attention to the dial. "Please," she muttered. "We need to hear this." The other workers from the steel mill waited silently, their faces stony. Nadezhda brought in another minute or two of speech: a different voice spoke about patriotism, sacrifice, Mother Russia. Anastasya, the supervisor of their group, reached over and switched the radio off. "Go on," she said. "Back to work." They're coming, and we won't be able to stop them. No one dared to speak the words. Nadezhda had to bite her tongue to keep from speaking them -- but it was better not to invite trouble. She retied the kerchief she wore to keep the sweat from her eyes and her hair out of the machinery. For days now there had been no real news. The official reports spoke of great Soviet victories, but these victories somehow happened closer to Moscow each day. Nadezhda returned late to the apartment she shared, pulling off her shoes in the cold stairway so as not to wake the others. Stepping over sleeping women, she picked her way to the kitchen in stocking feet. As quietly as she could, she boiled water for tea, then sat down by the window to stare out into the darkness. The Dnieper River was the last natural barrier before Moscow. And if Moscow fell. . . . Closing her eyes, Nadezhda could see the face of her lover, Vasily, before he'd left with the militia to fight. "We'll fight them to the end," he'd said, speaking softly to avoid being overheard. "We'll make them pay in German blood for every inch of Russian soil. But if Moscow falls, we'll be fighting a lost war." Vasily's blue eyes had been hard with fear, but he'd pulled loose her kerchief to stroke his fingers through her hair one last time before he boarded the train that would take him to the front. Vasily had no real military training -- that he'd been sent to fight spoke of the Red Army's desperation far more loudly than a thousand radio broadcasts. Nadezhda pulled her kerchief loose again and ran her own fingers slowly through her hair. She put away her teacup and took out her hidden bottle of vodka for a deep drink. Then she picked her way back through the apartment and out to the stairs, pulled on her shoes, and headed out of the small industrial city to the forests beyond. Nadezhda was young; she lived in a world of steel mills and radios and black-market cigarettes. Her grandmother, though, was from an older time. When Nadezhda was ten years old, her grandmother had stopped telling stories -- but Nadezhda had never forgotten the stories of the ancient woman who lived in the heart of every Russian forest, and how she could be found by those who weren't afraid to surrender to the darkness. As the sounds of the city and its factories were swallowed behind her in the night, Nadezhda pulled her kerchief out of her pocket, and tied it tightly over her eyes. Groping blindly with her hands in front of her, she continued down the path. Nadezhda could hear the wind around her, the trees overhead swaying in the night. She could hear an owl nearby, its call and then the beat of its wings. Then, silence. Nadezhda pulled the kerchief from her eyes, and before her in the forest was the little hut on chicken legs, rocking back and forth, turning round and round, dipping and spinning like a wobbly gear. Nadezhda spoke: "Turn comrade, spin comrade, stand comrade, stand. With your back to the wood and your door to me." The house turned to face Nadezhda, and the chicken legs knelt in the soft earth of the forest floor. The door swung in on its hinges. At first there was nothing inside but moist darkness. Then the darkness thickened and deepened, and a gust of warm wind from inside enveloped Nadezhda. Nadezhda smelled cooked kasha and fresh bread; she smelled sour vodka like Vasily's breath in early morning; she smelled wet new-turned earth. As the wind swirled around her and the last of the light faded, Nadezhda heard Baba Yaga's voice. "Russian blood and Russian tears, Russian breath and Russian bones, why have you come here?" Nadezhda had expected an old woman's voice, cracked and rough like the voices through the static of the radio. Instead Baba Yaga's voice was young and clear, honey-sweet and eggshell-smooth, but it echoed as if she spoke from the depths of a cave. "I've come to ask for your help, Comrade Baba Yaga," Nadezhda said. "I've come to ask you to save Mother Russia." Baba Yaga laughed, and now she sounded old. Two shriveled hands gripped the edges of the doorway for balance, and Baba Yaga stepped down to the ground. She was a stooped, hunched old woman with thin white hair. Her eyes were sunk deep in her wrinkled face, but they were a burning ice blue, and she had all of her teeth. "For everything there is a price, Comrade Daughter," Baba Yaga said. "For everything there is a cost. We are not socialists here. Have you come to me ready to pay?" "I have brought no money," Nadezhda said. "I do not trade in rubles," Baba Yaga said. "You have come to ask me to destroy the German army, have you not?" "You are prepared to give your life for this, if that is the price?" "Yes," Nadezhda said, though her voice shook. "Your life is not the price," Baba Yaga said. "The price is Vasily's life." Nadezhda was stunned silent for a moment. Then she pleaded, "Name another price." "That is the price for your salvation," Baba Yaga said. "If you will not pay, ask me some other favor." Nadezhda closed her eyes. She was too young to remember a time before socialism, and she barely remembered life before Comrade Stalin. But growing up, she'd known that it was fear of Stalin that silenced her grandmother's stories and her father's jokes. The first day that Vasily kissed Nadezhda, they found a secluded spot in the woods. Vasily pulled her kerchief loose to touch her hair -- then met her eyes with a wicked smile and said, without lowering his voice, "Have you heard the one about Comrade Stalin, Comrade Lenin, and Ivan the pig farmer?" Vasily was only a mediocre kisser, but it didn't matter. Nadezhda's heart had been his from that day on. Nadezhda opened her eyes and looked at Baba Yaga. Baba Yaga looked at her with eyes as deep and cold as the sea. Nadezhda looked away from those eyes and said, "If we had more time to prepare, perhaps we could beat them. Turn the Germans away from Moscow." "That's an easy favor," Baba Yaga said. "The price for that is your hair." Nadezhda had brought a knife, and now she took it and cut off her hair. She wished that she had thought to bring scissors, because she had to saw through the thick hank of hair, and it pulled. Her eyes were wet when she had finished. Looking at her hair in her hand, she touched it once more, as Vasily had, and then gave it to Baba Yaga. "What did you do to your hair?" Anastasya asked the next morning at the steel mill. "You look like a bobbed bourgeoisie." "I had lice," Nadezhda said. "Picking out nits would use hours that I could be working, so I cut off my hair. It's a small thing to sacrifice if it helps our army defend Mother Russia." Baba Yaga summoned the Fox, the craftiest of all the animals, who had fooled czars and peasants alike. "Run west to a country called Germany," she told the Fox. "To a city called Berlin, and find a little German man with a moustache." "Do you want me to eat him?" the Fox asked. "His bones are for me," Baba Yaga said. "I want you to whisper into his ear that there is plenty of time yet this summer to take our Moscow. Tell him that the wise course is to divide the troops headed for Moscow and send some of them north, to Leningrad, and some of them south, to the Ukraine. Do not return until you are certain he believes you." "I will do as you bid, Baba Yaga," the Fox said. So the Fox ran west and found Berlin, and the man with the moustache, and whispered into his ear. And the man with the moustache called his generals and ordered his troops divided, some sent north and the rest south, to return and finish off Moscow later in the summer. There was plenty of time -- weeks and weeks of glorious summer left to take Moscow. All the time in the world. Fall came, and the armies returned from Leningrad and the Ukraine and moved towards Moscow again. It was possible to be executed for spreading rumors, but the rumors still spread. Nadezhda heard whispers in the mill of the death and capture of millions of Russian soldiers, and tried not to listen. She heard whispers of siege and starvation in Leningrad, and tried to think of other things. She heard whispers that there were German soldiers in Red Army uniforms, infiltrating their forces and moving towards Moscow, and she snorted in disgust -- but the true rumors were bad enough. Nadezhda thought of Vasily often as she worked. They had quarreled sometimes, like any lovers, but only once seriously. Vasily had signed up for the militia, and Nadezhda had wanted to, as well. Vasily first tried to dissuade her with humor, but when that didn't work, he became angry. "Isn't it enough that the sons of Mother Russia go to die in this war? Should we send her daughters to die as well?" "Are you a German, thinking that a woman is good only for bearing babies?" Nadezhda fired back. "I know as much about fighting as you do." But Vasily refused to give up. The steel mill needed her. ("It needs you just as badly," Nadezhda said.) The militia would endure terrible hardships. If captured, Nadezhda could be raped, tortured, killed -- the Germans had no respect for women soldiers. Finally, Vasily had wept in her lap and begged her not to join the militia. Nadezhda had given in, unable to bear his tears. As the air turned chill, Nadezhda went again to the forest, to the hut on chicken legs and the old woman who lived inside. "The Germans have returned," Nadezhda said. "Yes," Baba Yaga said. "I did not promise that I would drive them away forever. You know the price for that." "Name any other price," Nadezhda begged, but Baba Yaga refused. Finally Nadezhda made a different request. "Stop the German advance, at least until spring," she said. "That's an easy favor," Baba Yaga said. "The price for that is your youth." "I give that willingly," Nadezhda said, and felt herself grow more tired, her face grow more creased. She returned to the factory by daybreak. "You look old," Anastasya said to Nadezhda the next morning. "Older than yesterday." "I'm tired," Nadezhda said. "Sleep uses hours that I can spend working. A little sleep is a small thing to sacrifice if it helps our army defeat the Nazis." Baba Yaga summoned Father Winter. "Go to the roads leading to Moscow," she said. "Bring rain to turn the roads to mud; then bring snow and ice and freezing winds. There are ill-dressed children on those roads. They do not belong there." Father Winter smiled his cold, fierce smile and bowed slowly to Baba Yaga. "When I am through with them," he said, "they will curse every inch of Russian soil they must cross to flee my breath." And Father Winter brought rain so hard the ill-dressed children thought they might drown, first in water and then in mud. Their tanks and their trucks sank deep into the thick black muck, and would not move. Then Father Winter blew out his cold breath over all of Russia. The ill-dressed children wore thin uniforms and light coats, without the felt boots and fur hats that the Russians wore. Some of them stumbled back the way they had come, dragging frozen tanks and trucks out of ice and snowdrifts. Their machinery and engines froze into cold, immovable blocks in the frigid breath of Father Winter, and the Russians on horses fell on the children and killed them by the thousands. The ill-dressed children cursed the Russian winter, and the Russian soldiers, and the Russian soil. Before Vasily left, he had given Nadezhda a square of red cloth. "It's a kerchief for your hair," he'd said. He pulled loose her old kerchief and stroked his fingers through her hair, brushing her cheek. Nadezhda pressed something cold and smooth into Vasily's hand. He opened his palm to see a rifle bullet. "My father fought for Russia in the war before the Revolution. He kept one cartridge in his pocket for good luck. He survived the war. Perhaps it will bring good luck to you, too." Vasily had closed his fist around the bullet, then wrapped his arms around her, burying his face in her shoulder. "Come back to me," Nadezhda had whispered into his hair. Spring came again, and the German army began to rally. Summer began, and they began to move again. They weren't moving on Moscow this time, but along the Volga and into the Caucasus. Rumors spoke again of terrible losses. In July, Nadezhda went again to the woods, to the hut on chicken legs and the old woman who lived inside. "The Germans have remounted their attack," Nadezhda said. "We are losing again." "Yes," Baba Yaga said. "They are moving along the Volga River, and the Red Army is falling back before them." "Please," Nadezhda said. "Destroy the German army. Stop them for good." "You know the price," Baba Yaga said. "Are you prepared to pay it?" "I will pay your price on one condition," Nadezhda said. "I want to see Vasily one more time before he has to die." "I can send you to the city where the battle will be," Baba Yaga said. "But if you go there, you may die with your lover." Baba Yaga took a horn and blew three blasts. From the sky flew an eagle. "Sit on the eagle's back," Baba Yaga said. "He will take you there." The eagle rose in the sky with Nadezhda on his back, and flew with her to the great city on the Volga River -- Stalingrad. Baba Yaga went herself to whisper to the man in Berlin with the moustache, and the man in Moscow named Josef. "No retreat," she whispered to Josef. "We must make our stand now, or die trying." At the end of July, Stalin issued a new order: "Not one step back!" Anyone who retreated without permission would be shot. Still, the Germans pushed forward, further and further, for Hitler had become obsessed with the city bearing Stalin's name. 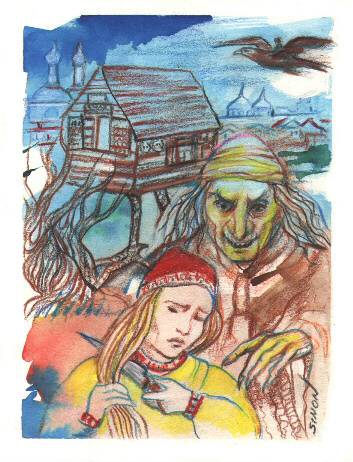 Nadezhda waited patiently, trusting in Baba Yaga's word that the Germans would be destroyed. The civilian population was evacuated from Stalingrad as the German army approached. Nadezhda remained behind with the other workers from the steel mill where she had found work. "I am no soldier," she said to her comrades. "But I can kill Germans." One of the other women spoke more eloquently. "We will die here," she said. "But we will teach the Germans something about Russian bones and Russian blood, Russian strength and Russian will. And no one will do to our children as the Germans have done to us." Nadezhda clasped hands with the other workers. There were no weapons. There was little they could do. But they would not retreat. Not one step back. The battle of Stalingrad began with an artillery attack, and Nadezhda spent the first few hours crouching in a bomb shelter with the other workers. As the artillery grew louder, Nadezhda left the bomb shelter -- Baba Yaga had said that she would see Vasily again, and after that, Nadezhda didn't care what happened. The others followed her out of the shelter, and soon they were able to pick up weapons from bodies in the streets. Nadezhda had never used a gun, but it wasn't difficult to learn. Nadezhda took shelter in an apartment building, firing out the window as German soldiers marched through the streets. It quickly became clear that the Germans would have to secure or destroy every building in Stalingrad in order to take the city. They set about grimly to do just that, but Stalingrad was a vast city, 30 miles long, winding along the edge of the Volga. And the new concrete buildings that lined Stalingrad's dirt streets were not easy to destroy. Through the months and months of house-to-house fighting, Nadezhda was never afraid. She would see Vasily; Baba Yaga had promised it. What had she to fear? Nadezhda found Vasily one bright afternoon in the coldest part of the winter. He lay slumped behind a low crumbling wall, alone. Nadezhda ran to him and dropped to her knees, taking his hand in both of hers. "Vasily," she said. Vasily was alive still, but would not live much longer. She could feel the blood from his wounds wet under her knees. She had tried to prepare herself for this, but in the end it made no difference. "Nadezhda?" Vasily said. "It can't be." "I'm here, my love," Nadezhda said. "I'm here to be with you." Vasily turned his face towards her. "I'm so sorry," he said. "The bullet you gave me, for good luck -- I used it." A faint smile crept to his lips. "I killed a German with it." Nadezhda pressed Vasily's hand to her face. "Our sacrifice is not for nothing," she said. "The German army will be destroyed here." Vasily nodded, but did not open his eyes. For a moment, Nadezhda thought he had died, but then he took another breath and his cold hand moved from her cheek towards the knot at the back of her neck. Nadezhda bent her head, and he loosened her kerchief and stroked his fingers through her shorn hair one last time. Then his hand fell away. Nadezhda took his hand again, to hold a moment longer. Then an artillery shell rocked the ground where Vasily lay. Nadezhda knew she didn't have much time left, but she wanted to die fighting, as Vasily had -- not mourning. Vasily had a rifle; Nadezhda took it from his body and slung the strap over her shoulder. Standing up, Nadezhda turned and saw the house on chicken legs. "Turn comrade, spin comrade, stand comrade, stand," Nadezhda said. "With your back to the armies and your door to me." Baba Yaga came out of her hut. Though before she had always been an ancient hag, today she appeared as a maiden younger than Nadezhda -- but her eyes were still as old as the Black Sea, burning like lights in a vast cavern. "What are you doing here?" Nadezhda asked. "I thought you stayed in your forest." "Sometimes I must attend to matters personally," Baba Yaga said. "This was one of those times." "Vasily is dead," Nadezhda said. "In one week, the Red Army will crush the army of the Germans, and their commander will surrender. There will be more offensives, but the Germans will never recover from this defeat. I have granted your wish," Baba Yaga said. "May I ask you a question?" Nadezhda said. "Pick your question carefully," Baba Yaga said. "I eat the overcurious." "Will Russia recover from this defeat?" "Life in Russia will never be easy," Baba Yaga said. "But Russia will always survive. Russian blood and Russian tears, Russian breath and Russian bones, these will last like the Caucasus and the Volga. No conqueror shall ever eat of Russia's fields. No czar shall ever tame the Russian heart. Your Comrade Josef will live another ten years yet, but when he dies, his statues will be toppled and his city will be renamed. That is what you wished to know, yes?" Another artillery shell exploded nearby; the ground shook, and the house stumbled slightly on its chicken legs. White dust settled slowly over Baba Yaga and Nadezhda, like snow, or spiderwebs. "Tell me, Comrade Daughter," Baba Yaga said. "Are there any bullets in that gun?" Nadezhda checked. "No," she said. "Then take this." Baba Yaga held out her hand; glinting in her palm, Nadezhda saw one bullet. "What is the price for that?" Nadezhda asked. "You have no payment left that interests me," Baba Yaga said. "This one is a gift." Warily, Nadezhda took the bullet and loaded it into the rifle. When she looked up, Baba Yaga and the hut on chicken legs had vanished. Nadezhda heard the sound of marching feet. She flattened herself against the remains of one wall, crouching down low to stay hidden. She peered around carefully, and saw German soldiers approaching. Nadezhda knew that in the dust and confusion of Stalingrad, the men would pass her by if she stayed hidden. Perhaps she could still slip away to the woods, survive the war, live to rebuild Russia and to drink vodka on Stalin's grave. Nadezhda turned back to look at Vasily one last time. Then, in a single smooth movement, she vaulted over the low wall that concealed her to face the German soldiers. Russia's blood can be shed; Russia's bones can be broken. But we will never surrender. And we will always survive. "For Russia," Nadezhda shouted, and raised her rifle. Naomi Kritzer grew up in Madison, Wisconsin, a small lunar colony populated mostly by Ph.D.s. She moved to Minnesota to attend college; after graduating with a BA in Religion, she became a technical writer. She now lives in Minneapolis with her family. Her first novel, Fires of the Faithful, will be published by Bantam in October. For more about her, see her Web site. Marge Ballif Simon teaches art in Florida and free lances as a writer-poet-illustrator for genre and mainstream publications including The Edge, Extremes, The Urbanite, Tomorrow Magazine of Speculative Fiction, and Space & Time, as well for the anthologies High Fantastic and Nebula Anthology 32. She is a former president of the SF Poetry Association and the current HWA Membership Chairman. She is the illustrator for EXTREMES 2 CD-ROM and Consumed, Reduced to Beautiful, Grey Ashes by Linda Addison, both Stoker Award winners. View more of her works or contact her for assignments at her Web site.